What is Prosciutto made of? Why cook with Prosciutto di Parma? One of the distinct features of traditional Italian cooking is the high quality of the ingredients used in every dish. 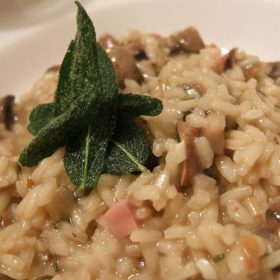 Risotto with ham, particularly prosciutto, is a great example of this. Not only will you get a lovely looking risotto, but also a poignantly flavorful dish with the prosciutto’s sweet delicate flavor. But before we proceed to the delicious recipe, let’s find out more about this savory Italian meat. Like most kinds of salami, prosciutto is made of pork. However, the meat used in making prosciutto is the lean hind leg or thigh (or as other call it, “ham”) part of the animal. Pancetta or bacon, on the other hand, makes use of the belly part. Aside from the fact that they come from different animal parts, pancetta also needs to be cooked before consumption. Now if you’re looking for high quality gourmet prosciutto, specifically Prosciutto di Parma, make sure it is made in Italy. 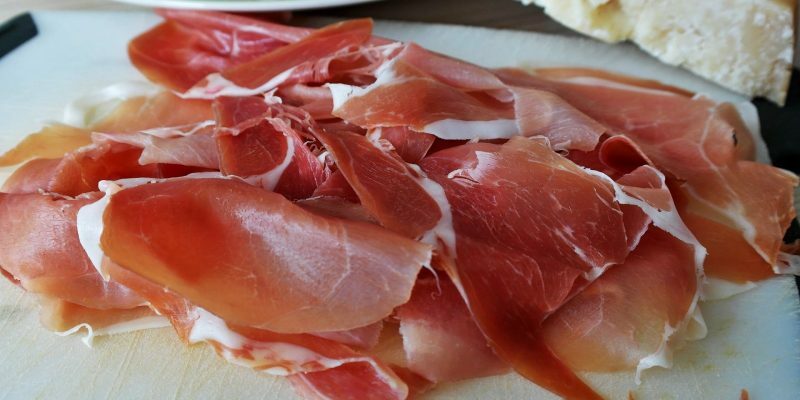 This ham is only produced in the province of Parma, in the Emili-Romagna region in Italy. Moreover, it is made under strict quality control procedures and only uses high quality ingredients. It also only uses specially bred pigs so you’re sure to get only the highest quality ham. Basically, there are two kinds of prosciutto from Italy. One is called prosciutto cotto, which is cooked ham, while the other is called prosciutto crudo, which is raw or uncooked. Prosciutto crudo, although raw, is perfectly safe to eat since it has undergone the curing process. This Italian ham will not just add some delicious savory flavor to your risotto, it is also a great source of protein, iron, zinc, niacin, and vitamin B12. So yes, contrary to what many health-conscious people may claim, there are some health benefits you can get from eating ham. However, much like everything else in life, moderation is the key. This is because prosciutto is also high in saturated fat and sodium, which may be reason enough not to consume this meat every day. 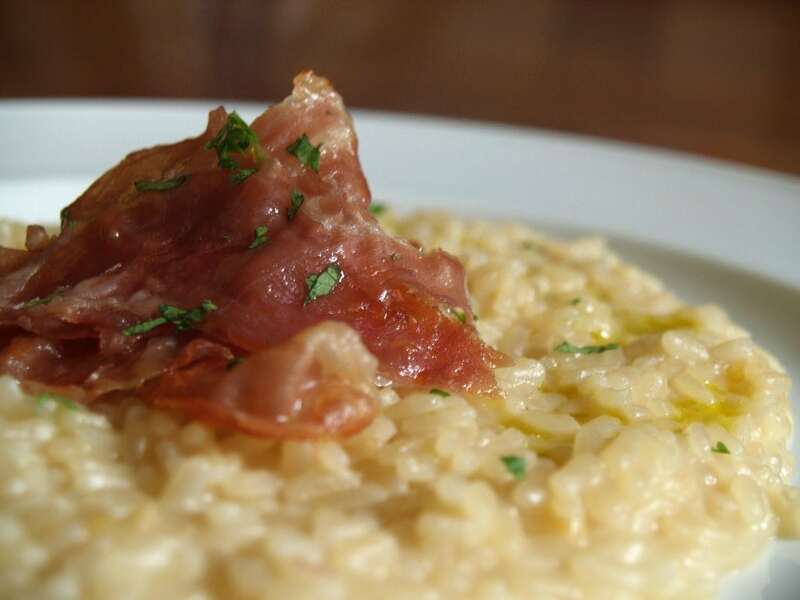 So how do you turn those Italian grain into a yummy plate of Risotto with Ham? Read the recipe below to find out. In a pan, melt the butter and add carrots and celery. Cook for about 8 to 10 minutes. Set aside. In a saucepan, put the extra virgin olive oil in medium heat and toast the rice for a couple of minutes. Next, add the white wine and cooke for a few minutes or until the wine has all but evaporated. Then, add 1 cup of broth. When the broth has almmost evaporated, add another cup. Repeat until you have added all the broth and the rice has softened. Add the carrots, celery, corn, and ham cubes. Lower the heat and slowly add the Parmesan cheese. Important thing to remember when cooking with Parma ham, add it at the last minute so you don’t overcook it. If you overcook it, the ham’s flavor will be compromised and the meat will become tough.